I decided to start with a collar from the Cutter's Practical Guide. The first thing I did was measure between the buttonholes on my shirt's collar band to figure out the actual measurements. Then I chose collar pattern #1 and scaled their dimensions to mine. I've actually made a set of scaled measuring tapes, but for this it was actually easier for me to just scale it by eye. 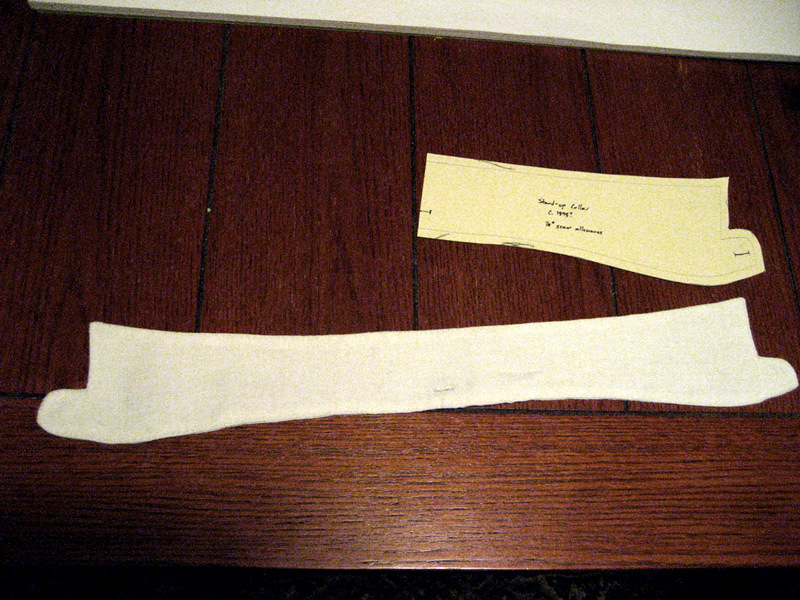 You can see below my pattern, with a quarter inch seam allowance added, and the nearly-finished collar. 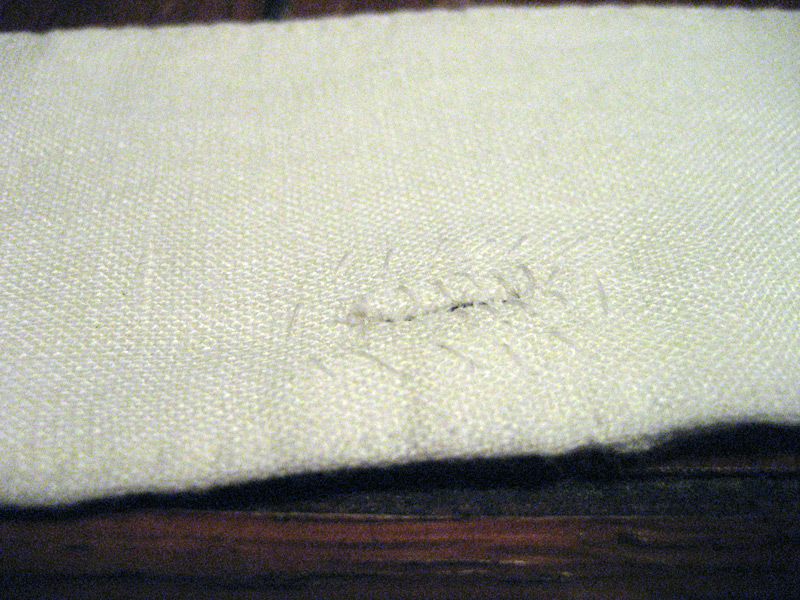 I made it of two layers of handkerchief-weight linen for the outside, and interlined it with the 5.3 oz linen I used for the rest of the shirt. From what I've read the heavier lining not only gives it more form on its own, but also absorbs and holds more starch, making it crisper in the end. 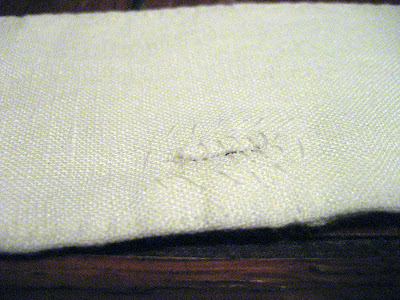 I apologise for the horrible quality of the photo, but at this stage it's been sewn and prick stitched around the edge, and I've started on the centre back buttonhole. Here's a closeup of the buttonhole in progress. I've basted around it so the three layers don't move while I work on it, and serged the edges of the buttonhole so it doesn't fray. I cut the hole itself in the traditional fashion, with a chisel. This keeps the hole cleaner than if I try to snip at it with scissors. 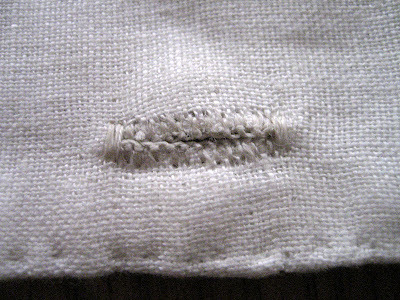 Finally, the finished buttonhole. I made my own twist with two strands of linen thread, waxed and twisted. Of course it picked up a little dirt and oil from my fingers when I did that so it isn't perfectly white, but I think that will partly wash out, and in any case will be under my tie while I'm wearing the collar.